Predictably, I had some trouble with some of the poses, especially anything that required flexibility through the hips. Evidently spending hours doing repetitive motions like running and cycling will do that to a person? Who’da thunk it. Anyway, in the past, I would have just tried to power through my body’s limitations anyway. I would see all of these other people serenely folding themselves into human origami, and I’d think, No way am I going to be the worst at yoga in this room. (Because yoga is all about being the best, amirite?) So I’d push myself a bit further than my body was capable of going, only to feel the inevitable ping of a strained muscle, and I’d spend the next two weeks babying the body part I’d hurt in my rush to show everyone that I was just as much of a serene piece of human origami as anyone else in the room. Curiously, though, during last night’s class, I noticed that I would have some trouble with some of the poses, and instead of forcing myself to do them anyway, I cut myself some slack. When the instructor demonstrated modifications to make the pose more difficult, I’d try them, and if I couldn’t hold it, I’d let it go and return to the easier modification. I only looked at the other people in the class a couple of times, just to make sure I was doing things properly. Rather than comparing myself to all of the more experienced people around me, I focused on my own body and what I was feeling and experiencing in that moment. You know how yoga instructors talk about honoring your body? Well, that’s what I did, and I have to say, it was outstanding. Sure, I wasn’t the most flexible person in the room. In fact, I was probably one of the least flexible people. I fell a couple of times. I couldn’t get my heels to touch the ground during downward dog and I had to rest my foot on my calf during tree, but I never once felt like a failure. Instead I understood that I was new to all of this and that as a result, things were going to be a bit more challenging. The only thing that mattered was that I was there and I was trying. I realized afterward that my eyes were trained firmly on my own yoga mat, both literally and metaphorically. I borrow the concept of “eyes on your own mat” from the Eating the Food group on Facebook, which is a closed group I’m part of that helps people who are recovering from restrictive ways of eating. I don’t really have a history of restriction or disordered eating but I find a lot of what the participants discuss to be very useful in my own life, and one of those concepts is “eyes on your own plate.” The idea is simple: focus only on what you are eating and don’t get all caught up in what other people are eating. You know, you do you, focus on your own journey, etc. etc. People who have eating disorders also seem to have an element of “hypercompetitiveness,” as one researcher put it, which explains why “eyes on your own plate” is so useful for members of the Eating the Food group. I’ve been reading a ton about female athletes and eating disorders and I have to say, it is absolutely not at all surprising to me that so many female athletes have eating disorders, because the disorder becomes yet another avenue for the competitive drive that pushes them to succeed in their sport. But this extends beyond the world of fitness and nutrition. In the past, when I was much less secure in myself, I used to feel quite competitive with other girls and women, mainly as a way of carving out a feeling of self-worth. I thought that if I could point out all of the other ways in which other women and girls sucked, I could make myself seem better by comparison. The ironic thing is that when I did the work necessary to build self-worth that was based on something more concrete than platitudes and wishful thinking, it became so much easier to see all of the wonderful qualities possessed by other people. Once I let go of that need to build myself up by tearing other women down, I was rewarded with deep friendships that have changed my life for the better. Another realm in which I have found that my competitiveness does me no favors is in the world of writing. Fellow writers, you understand this, how it can be so easy to become incredibly jealous of anyone with even a hint of success. This is something I still struggle with, that painful mix of awe and admiration and envy that arises whenever I see another writer achieving something I want for myself. But that’s all wasted energy, energy that could be better spent, you know, actually writing and trying to get my work out there and making connections with other writers who are doing the kind of work I admire. Of course, that’s easier said than done, but it’s definitely the ideal to which I aspire. I’m not saying that competitiveness doesn’t have value, and indeed, if properly harnessed it can be a pretty powerful force. But the key phrase there is “if properly harnessed.” If I use it carefully, it can push me to pursue my ambitions and to work hard and to maybe even achieve some of my goals. But if I let it run rampant, it can destroy everything it comes into contact with. What about you? Do you consider yourself to be a competitive person? Do you ever feel like you go overboard with it? If so, how do you manage to keep yourself in check so you don’t screw everything up? This is such an awesome post. I’ve enver commented before here but as a writer, long-distance runner, yoga person who can’t touch her toes or acomplish a heels-down down dog, and one who is conflicted about body image and self-worth, I had to chime in. Thanks!! If we could just go about the business of creating beauty in the world rather than comparing ourselves and finding ourselves constantly lacking and then beating ourselves up about it, think what a more beautiful place the world would be. Everyone has a voice. Each voice is unique and worthwhile. Let your voice sing! And listen with honor and respect to the other voices around you. I will have to read that book! I already use a foam roller pretty much every day, plus I use the Stick to get at my harder-to-reach body parts. I just realized after taking classes that involve dancing that my body is quite stiff and I’d like to change that. I am 53 and grew up when “Nice” girls were not competitive. And it was oh so important we be “Nice”. Sports for girls were not even on my radar. In my rural community girls were valued by how pretty they were and “Nice”. I did not even realized how fiercely competitive I was until a couple years ago –and it was wonderful to be able to own it without shame. But I still find it hidden away and sometimes it can pop out in all kinds of nasty inappropriate ways. This is a competitive society, and a sick one that seems to only value certain achievements or gifts. But as long as women are held back and their individual excellence is not celebrated, or only a select vision of a women is celebrated, our natural desire to compete goes underground; with often disastrous effects. I now participate in individual endurance sports, I really don’t know if I could outright beat somebody. This is why I love Serena Williams so much! She owns it –she wants to win with no apologies. I am not there yet and really don’t know if I will ever be. Great point about the way competitiveness is socialized according to gender. I grew up in a time when sports were not as controversial for girls to play, so it was available as an outlet for those urges, but I don’t think the gender stereotypes have faded completely. After all, it feels like at least once a year, I see an article that talks about how women are “naturally” more cooperative and men “naturally” more competitive, which I think is a total oversimplification of things. I went to my first “serious” yoga class a few months ago. 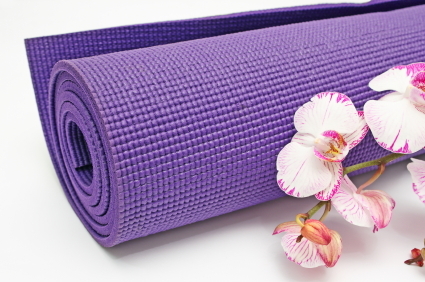 I’ve been to plenty of “yoga” classes at my gym, and plenty of free or beginner classes. But then I bought a Groupon for an actual yoga studio, and went to a class led by a serious yoga instructor (not just a fitness/group ex instructor), filled with fellow students who clearly do yoga more than a few times a year. Of course, being a runner, I like to think I’m the fittest person in almost any room, but I was quickly humbled. I stuck with the basic poses when the instructor was giving more difficult modifications. I barely did a tripod when others were doing headstands (although the instructor was very encouraging of what I could do). But I kept reminding myself that I’m a runner, not a yogini. I’m doing this to help with my running, so who cares if I can’t touch my feet to my head? I don’t have to be the best at everything. I’ve come to realize I will be SORELY disappointed if that’s my goal, so instead, I just focus on enjoying whatever it is I’m doing. Dude, I hear you on making the mistaken assumption that being a runner means you are automatically going to be Super Fit Beast Woman. I was disabused of that notion when I took up swimming and found myself regularly lapped by memaws in swimsuits with skirts. A slice of humble pie is a necessary but oft-overlooked part of any well-balanced emotional diet. It feels cheesy sometimes to say it but I really do believe in making the effort to be mindful and present in all things in life, if only because it makes things that much more pleasant and satisfying to experience. Can I just jump in for a minute to say how completely unnecessary and irrelevant it is to get your heels on the ground in down dog? Completely irrelevant. Doesn’t improve the pose at all. My preferred cue is to drop your heels towards the ground but don’t worry at all about whether or not they get there. And to anyone who says they can’t touch their toes? Try bending your knees! Works wonders. Oh, I am so relieved to hear this. I can never get my heels on the ground in downward dog and I thought it was a sign that I wasn’t doing things properly. This is good to know. Yep. Sometimes I will add “lengthen your calves (as much as feels good)” into the equation so the focus is on what is happening there rather than on the heels at all. I will keep this in mind. I do try to lengthen my calves but the muscles down the backs of my legs, while strong, are also rather tight. It feels sooo good just to stretch them, though. I was very fortunate that one of my first ever Yoga instructors once said, “they call it practice for a reason. There is no such thing as Yoga perfection, it’s always practicing.” That has helped me from the beginning “keep my eyes on my own mat” so to speak. That’s excellent. I love that. Thanks for sharing. Ha ha, my friend and I have had the conversation about telling ourselves off for thinking abut “winning” at yoga!! I love this post. I’m pretty competitive. It’s one of the reasons why I love racing. It’s a nice outlet for me to fulfill this need. I learned pretty early that I needed to “keep my eyes on my own mat” in yoga. Whenever I looked at people around me to compare and “compete,” I fell over because I wasn’t focusing on myself and my balance. I am competitive in certain aspects of my life and I wish I wasn’t! I’m also good at hiding it. The runner in me for sure. I have never done yoga, but I really enjoyed reading your piece about it. I could totally see myself trying to do the hard stuff and hurting myself. Yoga is really enjoyable (both physically and spiritually) and a lot of runners and triathletes seem to love it as a counterbalance to the repetitive nature of our sports. If you ever do decide to try it, just be aware of the possibility that you might feel inclined to go too far so you’ll know to nip it in the bud when it happens, sort of as a self-protective measure. I’m a little bit competitive. I like to win, but I feel super, super embarrassed about losing, so I typically try to hide the competing. And with yoga- doing the work for flexibility is good, even if you can’t wrap your leg behind your head. I worked at a yoga studio for a bit. And we were a pretty serious one, with some really, really serious clients (this is Madison, after all). There were people there to be able to do a full, extended Crow, and there were people there to supplement their physical therapy. We eventually got a couple of instructors from another studio who were, seriously, competitive yoga people. They’d push people past their limits, and it really ended up being a problem. Oh, I am right with you on the hiding-competitiveness! That’s such a good way to describe that set of feelings, and I feel that way a lot. An issue that I have with a lot of yoga classes (and you might have too, Caitlin) is that they are structured as a whole workout. For me, yoga is a flexibility addon; chances are I already ran or lifted that day, so I don’t want a quad-burning strength session. But most classes assume that people do yoga as their primary/only fitness activity and really want long-held strength poses. I’m there to get bendy, not buff! Totally feel everything you mentioned here. I took up yoga to help stretch out my legs, as running makes them tight as all get out… and even after years I can still not get my heels to the floor in downward dog. Interesting. I’m an on-and-off runner and I take yoga/pilates classes. A couple of my friends who are runners with more competitive personalities then mine. Two of them participated in a pretty big thing aand they tried to get me to join. At some point I mentioned that my training was more or less time based, not on getting faster. That seemed to throw them. Apparently, I’m taking a yoga approach to running? Great post Caitlin. About competitiveness. I’m not at all with others; just super-obsessive when it comes to one-upping myself. The one thought that keeps me in check is that I absolutely, totally, do not, will not, allow myself to be hurt. And then benched from exercise. That would depress me in a huge way. If I see something I want to try, and have any inkling that it may be dangerous, or I’m not really, I hold back. I think that’s one of the big reasons I won’t run, because so many of my friends end up benched from training after 6 months or so….Anyway, love yoga though. I try to keep that in the mix once a week.Love your posts and your writing so keep doing what you are doing! Wow reading this felt like you were inside my head. I am definitely competitive, not overly so, but OH BOY do I ever compare myself to others. The ‘eyes on your own plate’ thing really struck home, because I notice myself doing that but never really understood why and how to stop it. With running I sometimes feel disheartened by reading so many blogs and thus comparing my abilities to those I read about. But every is fighting their own battles to get there, and I have to remember that others look at me in the same comparison too. We’re all doing the best we can, and we should celebrate others achievements wholeheartedly without envy. It’s not always easy to do, but it’s liberating when it happens. i found that almost as soon as i understood enough of the cues to be sure i knew what i was doing, i began unconsciously closing my eyes throughout large portions of a class. i guess it was my way of “staying on my mat” and keeping my practice about what i can do and what i feel and my body feels like doing that day. (i also close my eyes when i lift so who knows, maybe i just have shy eyeballs!) anyway, lovely post, and i’m glad you had a wonderful class! This is partly why I seem to be moving away from CrossFit, even though I love it. Timed group workouts can be an injury trap if one forgets to keep one’s eyes on one’s own barbell, and the competitive aspect can kill the fun. I visited a new box the other night and was having a great time until a couple of people started in with the “Why don’t you put some weight on the bar, dude; heh heh heh” schtick. And then, of course, just about everyone’s form went to crap during the last 5 desperate minutes on the clock. Funny, how Crossfit and yoga — opposites in many ways — have similar traps. Not even counting the food weirdness connected to both (in my own experience, anyway). Good piece. I have started having private lessons in the comfort of my own lounge room. The only person to compare myself to is my husband who has totally different strengths and weaknesses to what I do. Love it! I am a competitive artist. But I strive to compete with myself and help other women out as best I am able. I don’t feel the need to excel a tony ones cost. Bettering my own skills is what I care about, making sure that I use negative feedback to my advantage, identifying lack and applying knowledge appropriately, while encouraging my friends to do the same is of utmost importance. As for exercise, I like to compete with myself and do well by my body. I only have one body, and one life. I take care of my body as best I am able. I can’t compare my body to anyone else, it is mine and I have no idea what it is like to walk in anyone else’s shoes, so I try to limit comparison as much as possible.